Just last week I was in Athens as part of the LSE City of Refuge project team, where we repeated the process begun in London in July and continued in Berlin in October, to engage with refugees, or newcomers, and the citizen actors who welcome and support them. This involves building links with local organisations and activists, as well as the newcomers themselves, to hear their stories and to invite them into a process where we can learn from their experiences. Much as in London and Berlin, I have supported and helped supervise facilitating the workshops I devised. 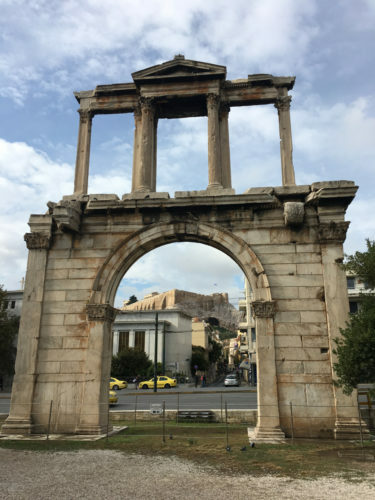 These are conducted in the languages of the newcomers (mainly Arabic & Turkish) and the local citizen actors (Greek & English) and were all held in the multicultural 87th Elementary School of Athens in the Gazi district. This meant a partial re-configuration due to the wider mix of languages – with Myria Georgiou leading the Greek-speaking group, alongside her assistant PhD student, Afroditi-Maria Koulaxi and Dr Vivi Theodoropoulou. Meanwhile Deena Dajani and I led the English-focused group while local activist and teacher, Natasa Vourna, provided Turkish-language facilitation for the Kurdish newcomers’ group. Deena also led the Arabic-speaking group in the second session. As before Marcia Chandra has been a key part of the workshops as her series of portraits accompanying the project develops in each site. The images of the worksheets below demonstrate, again, the strong levels of engagement and enthusiasm which all the participants brought to this process, capturing and sharing their thoughts, emotions and experiences. Many deeply affecting stories emerged: of difficult journeys across time and space, of acceptance and rejections, of exile and new homes. The range of places that people had originated from was also wider than we had encountered in London or Berlin, with new and different themes emerging which resonated but also struck different notes. One of the key differences was the international cast of citizen actors who had come to Greece to help support the steady stream of refugees. There was also a sense that the situation was more complex than we had previously encountered – against the backdrop of the continuing economic problems experienced in the wake of the 2008 financial crash, and the strong presence of international aid agencies in coping with the scale of the humanitarian emergency of people fleeing war and terror in the region. There seemed more fluidity in terms of what it meant for people to be ‘settled’ in Greece, and a multi-varied strata of access and opportunity depending on who you were and where you came from. The project will now go into an analysis and writing up stage, with outcomes due in the Spring – including an exhibition of Marcia’s portraits and stories. Combined with the detailed interviews this should prove to be a powerful examination of what it is like both to experience being a newcomer and to be part of the fabric of support that welcomes and supports them across the three cities, hopefully revealing insights that could strengthen international links between citizens and improve policies.